Buy this unique 999 pure 1 oz Athenian Owl silver coin, featuring a modern rendition of the Ancient Greek Tetradrachm as used 2500 years ago. Ancient Greece is often referred to as the birthplace of Western culture and democracy, and is famous for its advancement of philosophy, science and mathematics. Athens also had state ownership of the silver mines at nearby Laurium, which was one of the main sources of revenue for the Athenian state. The tetradrachm functioned almost like an early reserve currency, used by both the friends and enemies of Athens as a common currency. The reverse of this coin features an Athenian Owl standing on a branch, with a sprig of olive and a crescent moon just as on the ancient coin. Unlike the tetradrachm which had 17.2 grams of silver, this modern rendition is one full troy ounce, or 31.103 grams. The letters AOE stand for Alethia Orno Eternia which translates as Truth, Honour and Forever. Add this homage to sound money to your collection today! 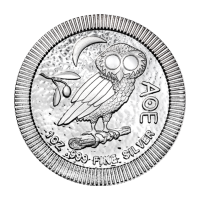 앞면 Effigy of Queen Elizabeth II and the words "Elizabeth II Niue Two Dollars 2017"
뒷면 Owl standing on a branch and the words "AOE 1 oz 999 Fine Silver"
Effigy of Queen Elizabeth II and the words "Elizabeth II Niue Two Dollars 2017"
Owl standing on a branch and the words "AOE 1 oz 999 Fine Silver"
1 oz 2017 Athenian Owl Stackable Silver Coin Buy this unique 999 pure 1 oz Athenian Owl silver coin, featuring a modern rendition of the Ancient Greek Tetradrachm as used 2500 years ago. Ancient Greece is often referred to as the birthplace of Western culture and democracy, and is famous for its advancement of philosophy, science and mathematics. Athens also had state ownership of the silver mines at nearby Laurium, which was one of the main sources of revenue for the Athenian state. The tetradrachm functioned almost like an early reserve currency, used by both the friends and enemies of Athens as a common currency. The reverse of this coin features an Athenian Owl standing on a branch, with a sprig of olive and a crescent moon just as on the ancient coin. Unlike the tetradrachm which had 17.2 grams of silver, this modern rendition is one full troy ounce, or 31.103 grams. The letters AOE stand for Alethia Orno Eternia which translates as Truth, Honour and Forever. Add this homage to sound money to your collection today!